Partly cloudy skies. Low 48F. WNW winds at 15 to 25 mph, decreasing to less than 5 mph.. Partly cloudy skies. Low 48F. WNW winds at 15 to 25 mph, decreasing to less than 5 mph. The most sleep-deprived cities are largely found on the East Coast and in the Midwest. Hard work has long been the bedrock on which the American dream was built. But when hard work gets in the way of sleep, research suggests, it might just have the opposite effect. Sleep is slowly becoming a luxury good in the U.S., and a lack of it might affect not only how tired someone feels, but also that person’s income, health, and family life. The Center for Disease Control and Prevention (CDC) recommends that adults ages 18-60 should get at least 7 hours of sleep per night. However, the CDC reports more than 35 percent of the U.S. population gets less than that. Sleeping less than the recommended amount is associated with a wide range of health problems, from heart disease and mood disorders to diabetes and obesity. 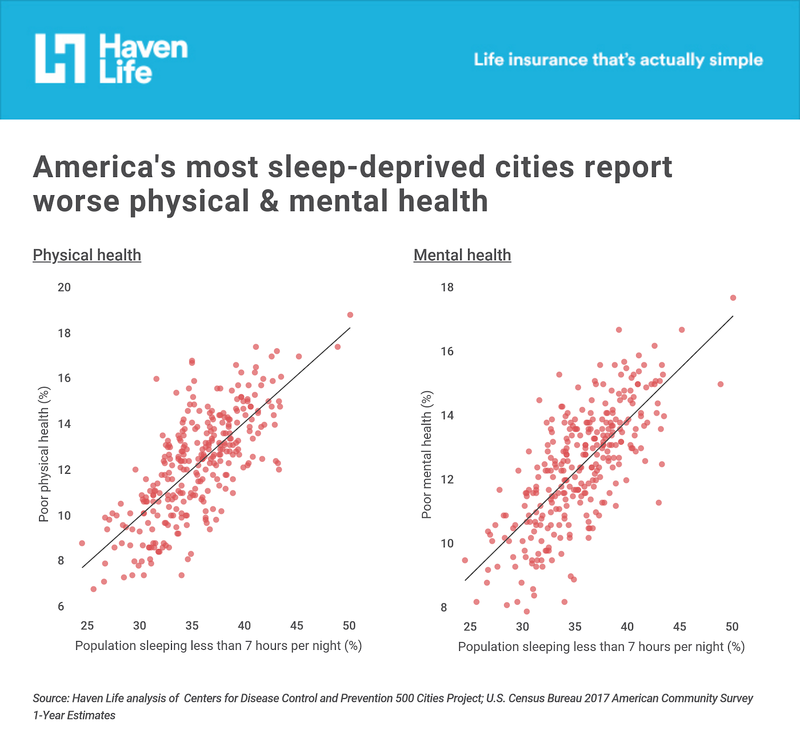 Similarly, data from the CDC 500 Cities project shows a strong correlation between sleep and self-reported physical and mental health, as well as physical activity and weight, according to a Haven Life analysis. At the national level, 11.5 percent of the population suffers from poor physical health, 11.9 percent from poor mental health, 23.7 percent from a lack of physical exercise, and 29.5 percent from obesity, according to a Haven Life analysis of the CDC data. 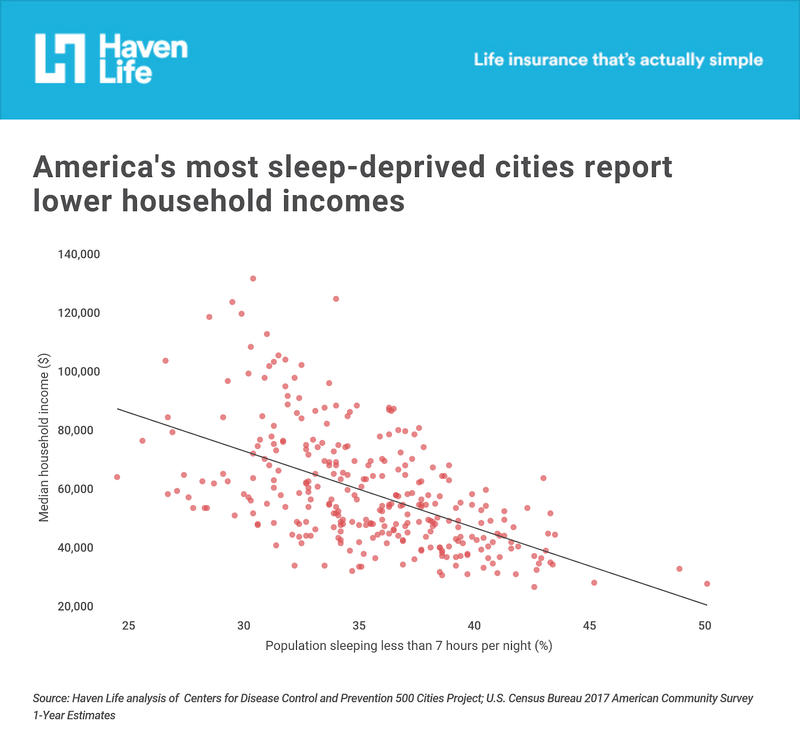 At the city level, as sleep habits dip below seven hours and household incomes decline below the national median of $60,336, these negative health metrics are more likely to increase. In addition to the effects on the individual, sleep deprivation affects the family too. Research shows that it takes more than six years for first-time parents’ sleep routines to return to normal, pre-parenting levels. This is noteworthy given that parental sleep deprivation can influence childhood development, from infancy through adolescence. In addition, those who suffer from a lack of sleep might also struggle with key behaviors needed for effective parenting. Interestingly, some parts of the country are more likely to suffer from sleep deprivation than others. To find which cities are the most sleep-deprived, Haven Life analyzed statistics from the Centers for Disease Control and Prevention’s 500 Cities Project and the U.S. Census Bureau’s American Community Survey. 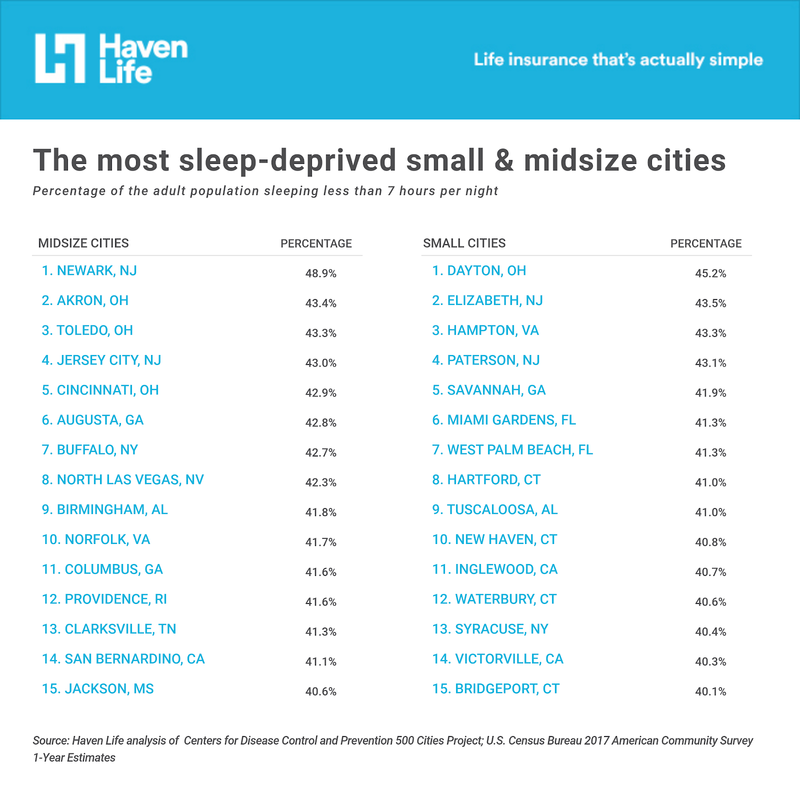 For each city — grouped into large, midsize, and small cities based on population — Haven Life looked at the percentage of adults who get less than seven hours of sleep per night. With 38 percent of its residents getting less than seven hours of sleep per night, Louisville — the most populous city in Kentucky — might benefit from some additional shut-eye. 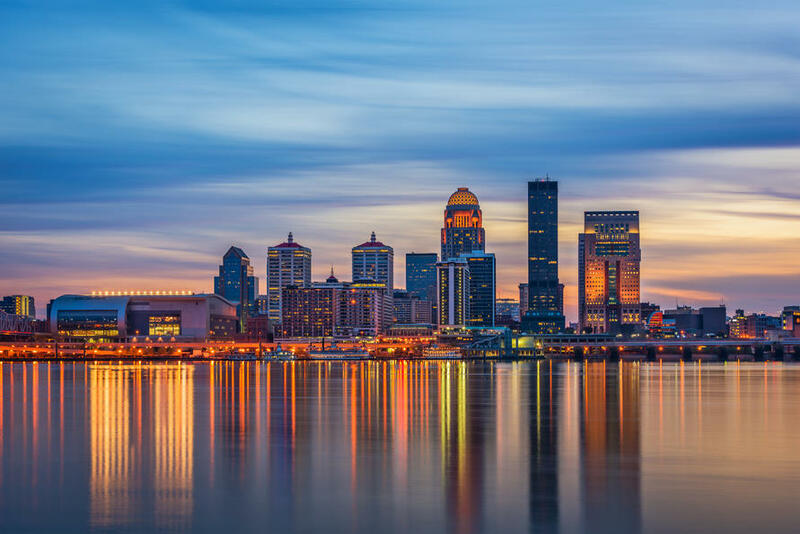 Louisville reports below average health statistics across all of the above metrics and a median household income that’s 14 percent below the national median. Residents in neighboring Lexington get slightly more sleep and report better health outcomes across the board. 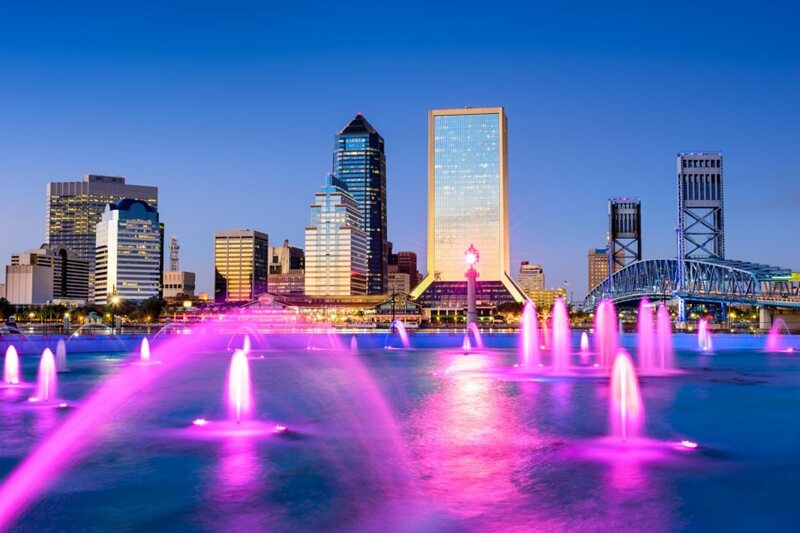 With 38.1 percent of the population sleeping less than the recommended amount, residents in Jacksonville are feeling the effects of sleep deprivation. The city scores poorly on all other health measures when compared to the national averages. Notably, the lack of physical activity in Jacksonville scores 4.8 percentage points worse than the national average. Likewise, the median household income in Jacksonville is almost 15 percent below the national median. 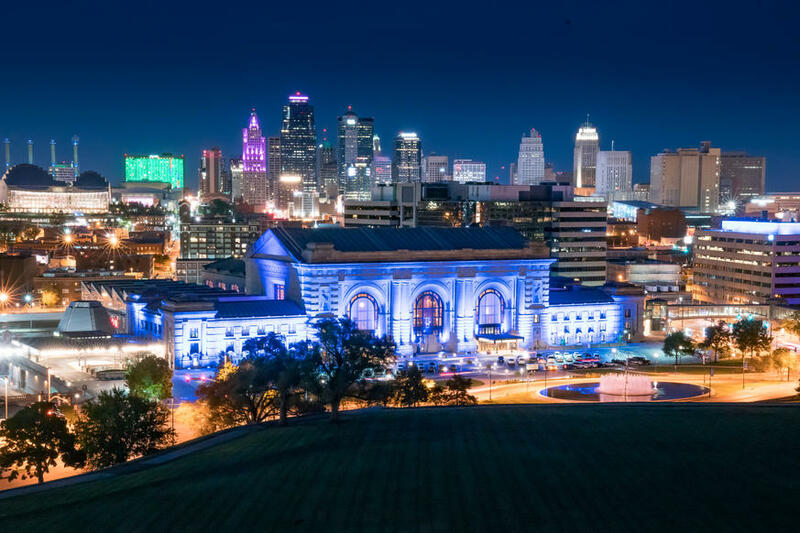 The most populous city in Missouri, Kansas City has a sleep deprivation rate of 38.2 percent. Kansas City is the most active city on this list, with 75 percent of people reporting physical exercise. However, this is still 1.4 percentage points worse than the national average. Residents of Kansas City earn about 15 percent less than the typical American. Despite 38.3 percent of the population getting less than 7 hours of sleep, Atlanta has the best mental and physical health outcomes on this list, with only 11.8 percent of residents experiencing symptoms of poor mental health and only 12.1 percent experiencing symptoms of poor physical health. 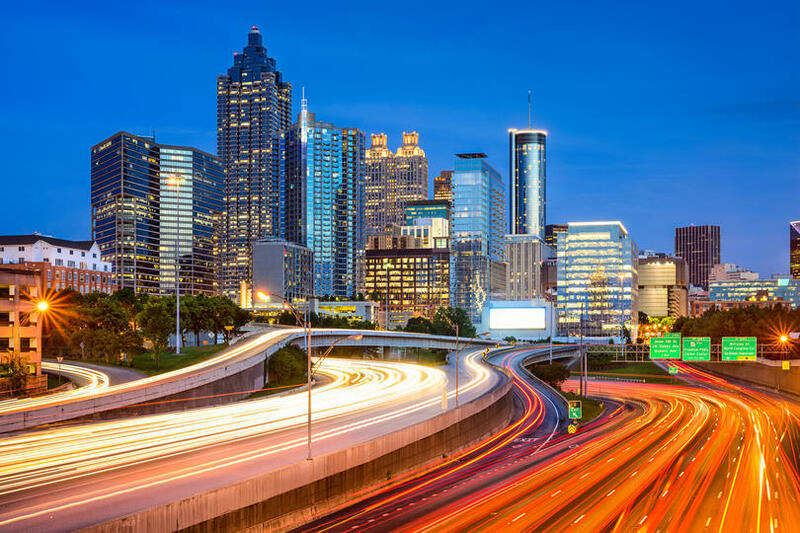 The obesity rate and poor mental health rate in Atlanta are slightly below the national averages, but poor physical health and lack of physical activity are higher than the rest of the country overall. 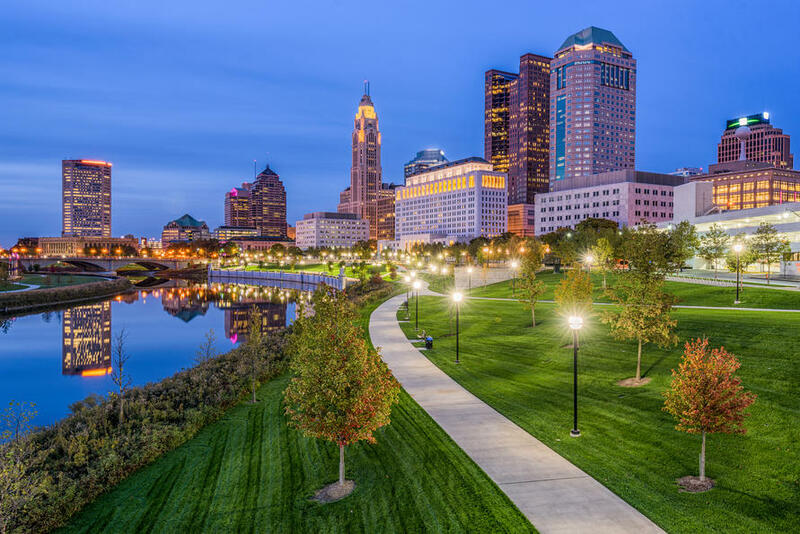 The first of two Ohio cities on this list, Columbus experiences below average health statistics as well as a distinct lack of sleep — 38.9 percent of residents report sleeping less than 7 hours per night. Approximately one in three Columbus residents suffer from obesity. 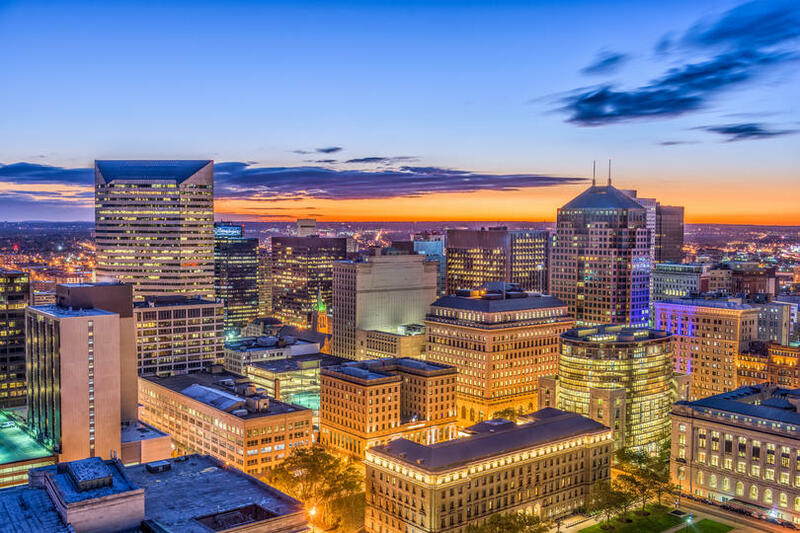 Despite having the highest median household income of all cities in Ohio based on the full analysis, Columbus is still 14.3 percent lower than the national median. With 39.2 percent of the population sleeping less than 7 hours per night, residents in Wisconsin’s largest city also report below average health outcomes. In particular, the obesity rate in Milwaukee is 9 percentage points higher than the nation’s overall obesity rate. By contrast, only 29.3 percent of residents in nearby Madison sleep less than 7 hours per night, and this city reports significantly better health outcomes overall. The median household income in Milwaukee is 35 percent lower than the national median. 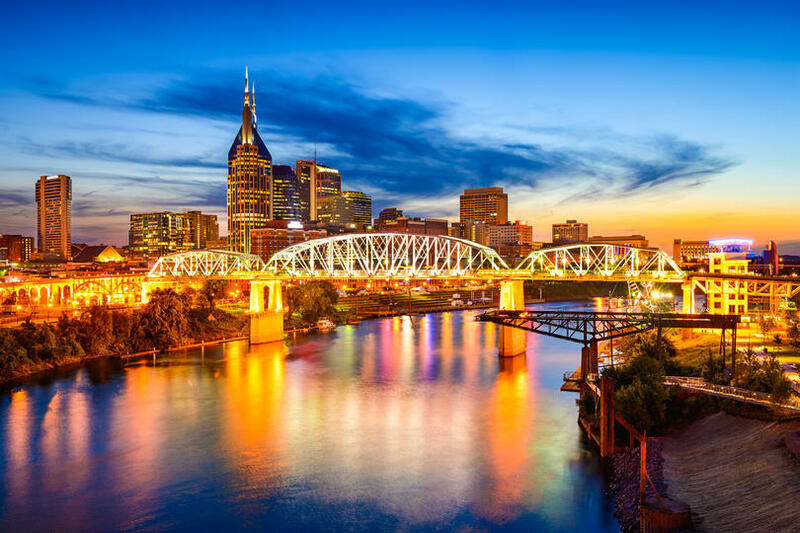 Residents in Nashville, Tennessee’s most populous city, might want to hit the snooze button a few more times. About 39.4 percent of the population gets less than the recommended amount of sleep, perhaps contributing to its below average health statistics and incomes. 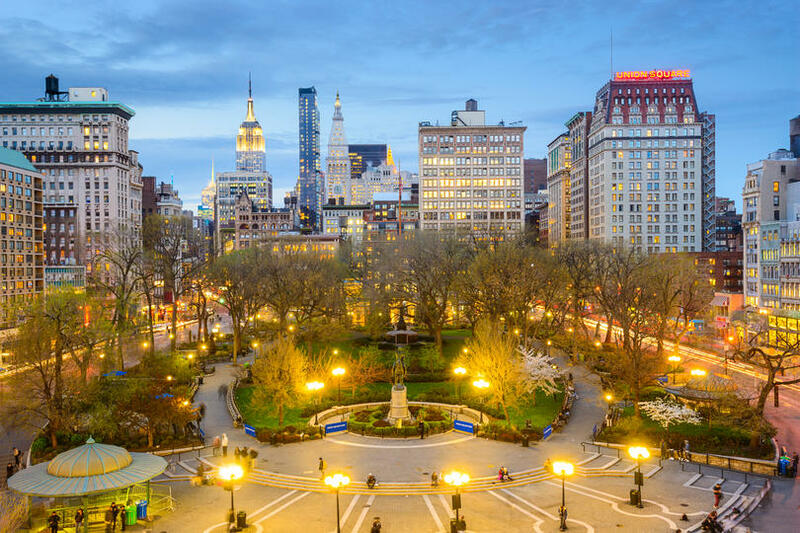 There’s a reason why New York is called “the city that never sleeps.” Almost 40 percent of the city’s population — meaning more than 3.4 million people — report sleeping less than 7 hours per night. Despite 28.2 percent of the population lacking physical activity, New York has the lowest obesity rate on this list at 25.1 percent, slightly below the national average. New York also has the highest median household income on this list ($60,879), slightly above the national median. This desert city could use a few more visits from the Sandman. 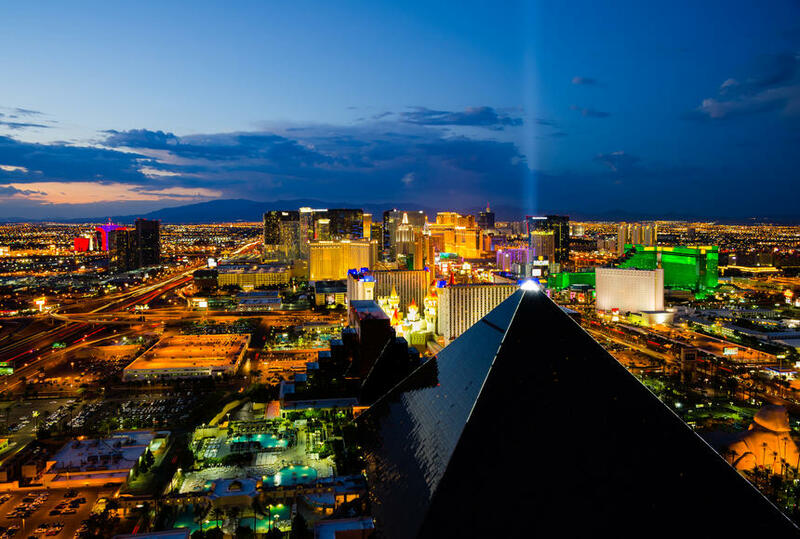 An astonishing 40.5 percent of the Las Vegas population reports sleeping less than 7 hours per night. Like New York, the obesity rate in Las Vegas is below the national average. However, all other health statistics for Las Vegas lag behind the nation as a whole. 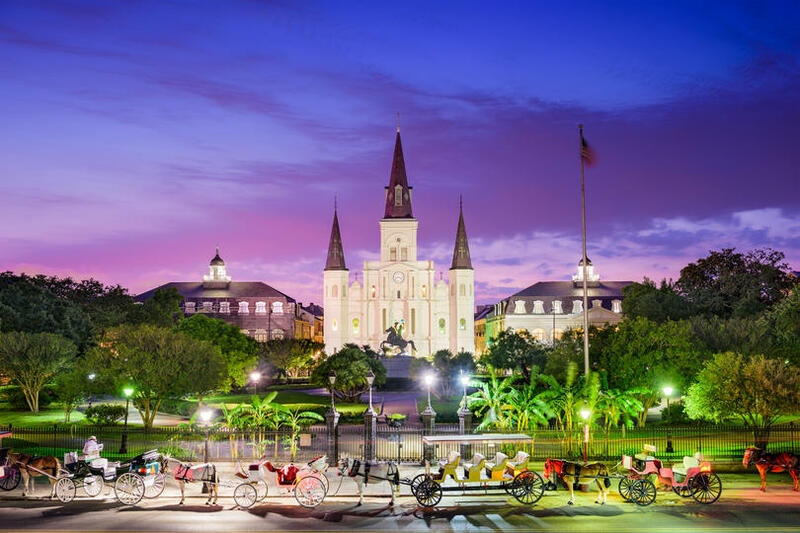 With 40.8 percent of the population not getting their full 7 hours a night, residents in New Orleans should catch a few more zzz’s. Health data for New Orleans reveals poor mental and physical health outcomes compared to the national averages. Notably, the obesity rate is 5 percentage points higher than the national average. The median household income in New Orleans is also about 39 percent lower than the national median. 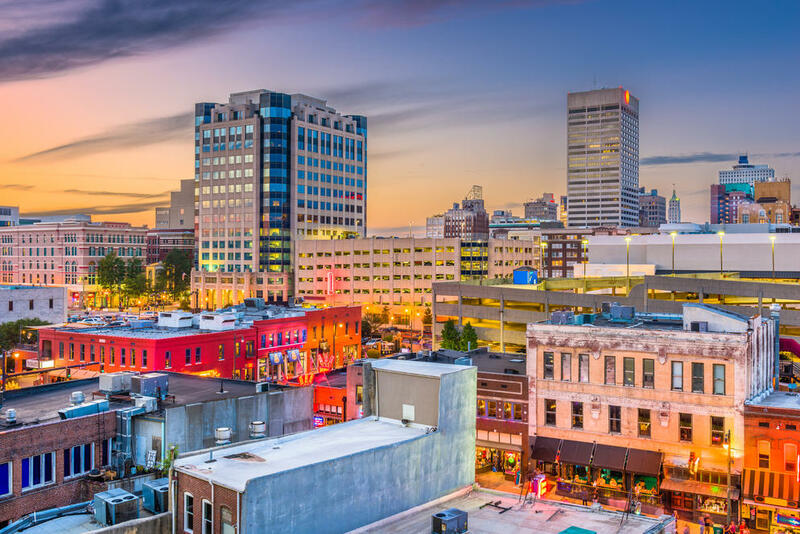 Memphis, Tennessee’s second-largest city, is struggling with the effects of sleep debt, with 41.1 percent of residents sleeping less than the recommended amount per night. In Memphis, 32.1 percent of people lack physical activity (8.4 percentage points above the national average), and 16.8 percent report poor physical health (5.3 percentage points higher than the national average). In addition, the obesity rate in Memphis is a shocking 11.5 percentage points higher than the national obesity rate. The median household income in Memphis is about 35 percent lower than the national median. In Cleveland, 42.6 percent of residents report sleeping less than 7 hours per night. The least active city on this list, 36.1 percent of Cleveland residents suffer from a lack of physical activity. Similarly, the obesity rate is also 10 percentage points higher than the national average. At $28,974, Cleveland has the lowest median income on this list, 52 percent lower than the national median. With 42.6 percent of the population not getting their recommended sleep hours, Philadelphia should set an earlier bedtime. 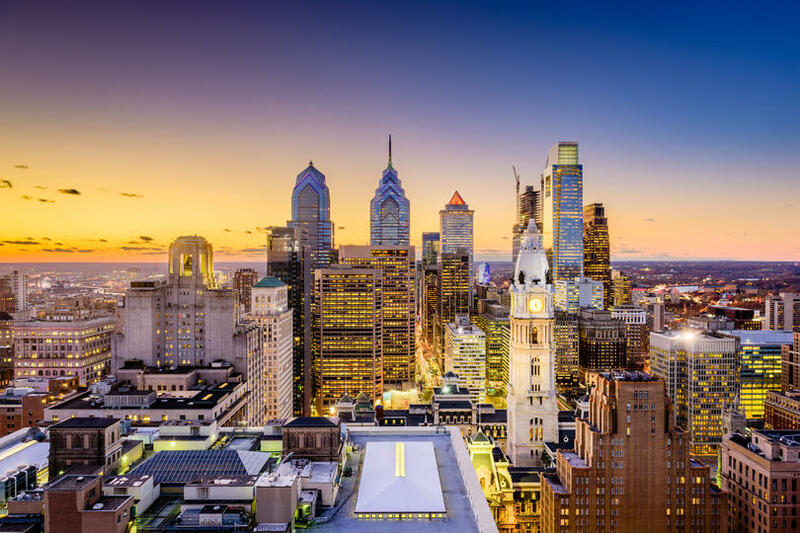 The obesity rate in Philadelphia is only slightly higher than the national average, but the health metrics related to physical and mental health are between 3 and 4 percentage points worse than the national averages. Residents in Philadelphia make 30 percent less than the national median income. In Baltimore, 43.2 percent of residents aren’t sleeping enough. While Baltimore reports slightly below average physical and mental health outcomes, the percentage of Baltimore residents suffering from a lack of physical activity and obesity are significantly worse than the national average (5.4 and 6.6 percentage points higher, respectively). 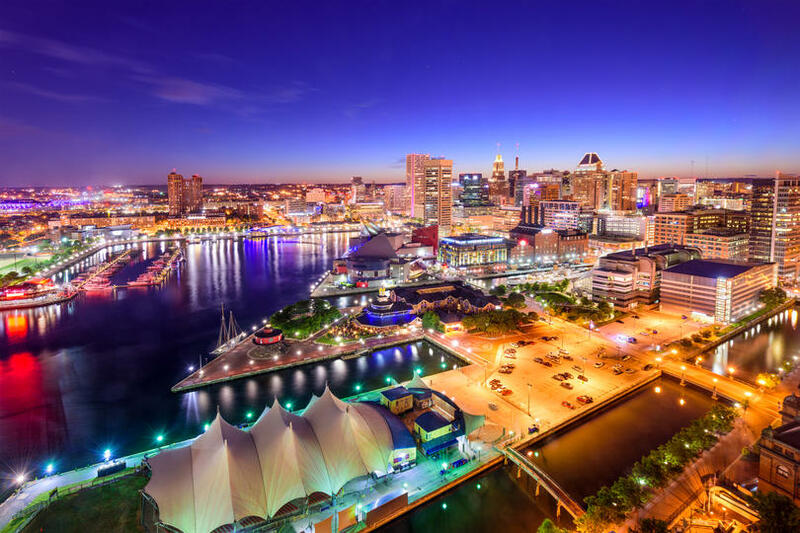 Incomes in Baltimore are more than 20 percent below the national median. Across the board, Detroit has the worst sleep and health metrics on this list. 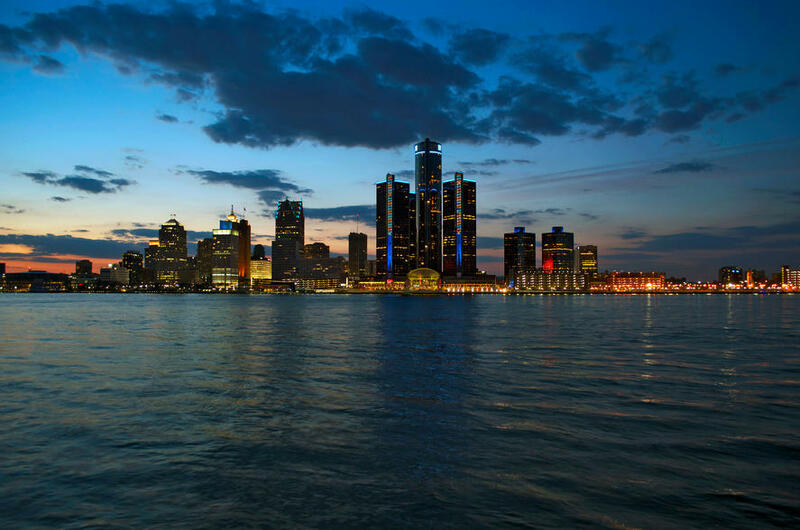 More than half of the population in Detroit sleeps less than 7 hours per night. 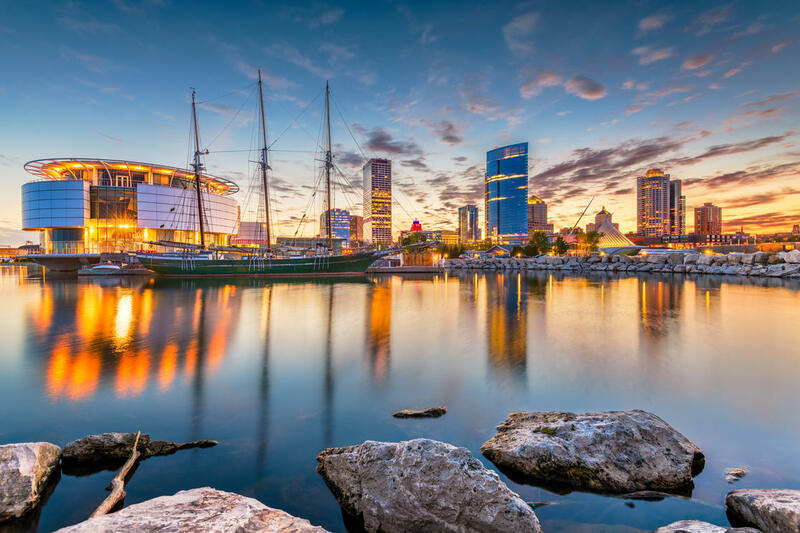 Detroit has the highest obesity rate on this list (47.4 percent), the highest percentage of people experiencing poor mental health (17.9 percent) and the lack of physical activity in Detroit is 12 percentage points higher than the national average. The median income in Detroit is the second lowest on this list — 50 percent lower than the national median. Health statistics are from the Centers for Disease Control and Prevention’s 500 Cities Project. Median household incomes and population statistics are provided by the U.S. Census Bureau’s 2017 American Community Survey 1-Year Estimates. For each city, data points were selected based on their correlation with the percentage of the population sleeping less than seven hours per night. Only variables with a Pearson correlation coefficient greater than .4 or less than -.4 (at least a weak to moderate correlation) were considered. Only large cities were included in the final list of items. For a complete set of results, visit the original version on the Haven Life website.